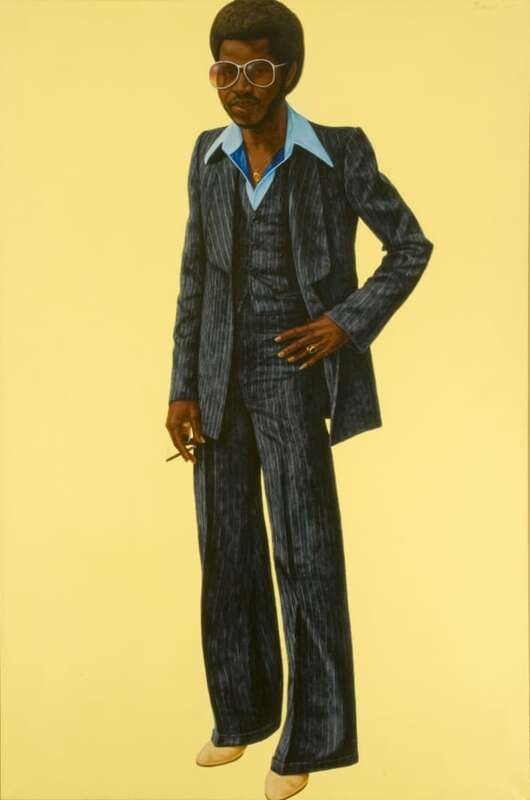 Barkley L. Hendricks, Noir, 1978. Oil and acrylic on canvas, 72 x 48 inches. Rubell Family Collection, Miami. Best known for his life-sized portraits of stylish people posed against flat, monochromatic backgrounds, Hendricks’ painting encompasses themes of power, fashion, beauty, and politics. His work refers not to generalized types, but to very particular subjects, objects, and locations. During a trip to Paris, he met and photographed a number of the sitters for portraits he made in the late 1970s, including preliminary work for Noir. The sitter’s style, confidence, and nonchalance—highlighted by his dangling cigarette—represent the embodiment of a certain vision of coolness, sensuality, and power. There is something about the fact that Hendricks’s paintings are life-size that makes them both commanding and approachable, conveying a real human presence even in their stylized colors and poses.